Geoff and Tina Wilson planned to live off the grid in a remote part of Utah when things went horribly awry. Smoke from wildfires and steady rains hampered their lone solar panel, and their generator broke. Health problems prevented Geoff, a Navy veteran, from working, and Tina worked only part-time as a teacher’s aide. Their savings were all used up to pay for Geoff’s medical expenses. 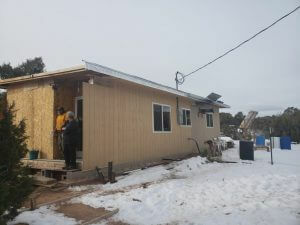 The Wilsons were coping with those hardships for nearly two years until employees at Moon Lake Electric Association Inc. in Roosevelt, Utah, adopted the couple during the holidays, an act that brought power—and so much more—to their house. Shortly after the Wilsons, both in their mid-fifties, got married in March 2016, they settled in Geoff’s house in Talmage, an unincorporated stretch of Utah, where they could enjoy peace, quiet and unspoiled views. The 600-square-foot house was wired for electricity, but they couldn’t afford the line extension. So they decided to go without. Tragedy struck in late May 2017 when Geoff, a sonar technician on a U.S. Navy submarine, was infected with hantavirus, a severe, sometimes fatal, respiratory disease spread through rodent droppings. Complications resulted in a six-month hospital stay and the amputation of both legs. To be closer to Tina’s job, they relocated that summer to a temporary home in Altamont. What savings they had were wiped out. In all that time, the Wilsons never called Moon Lake Electric Association for help, or anyone else for that matter. That’s not surprising, said Yankton Johnson, the co-op’s manager of personnel and member relations. “We kind of assume that some of our members are out here because, first off, they don’t have a ton of money. And secondly, they just want to live a secluded life. We’re about three hours from Salt Lake City, and a lot of people move into our area simply because they want to be left alone. We just don’t get to know a lot of these folks,” said Johnson. The barrier of anonymity fell just before the holidays last year. Each season, co-op employees survey members and pool resources to help a family struck by hardship. Curtis Miles, the co-op’s line superintendent, nominated the Wilsons. Sabrina, Miles’ wife and a coworker of Tina’s at the school district, knew the couple’s circumstances. Employees and directors gladly chipped in about $3,900, and crews offered to extend the line from the road to the Wilsons’ house for free. But the co-op soon learned that a solution to the Wilsons’ troubles was far more complex: The Talmage house failed a mandatory inspection because of lack of running water and an inadequate septic system. That’s when things started moving quickly—and way beyond anyone’s initial expectations. The co-op’s connections in the community led to in-kind and cash contributions of about $20,000 to $25,000, including labor and parts. Contributions from local companies included a septic tank and pipe from Mountain Land Supply, a septic system design from an excavator, and a new fuse box and new wiring from an electrician. When the county objected to the lack of running water—stalling the project a second time—and assessed nearly $1,000 in fees and penalties for building violations incurred by the Wilsons, the co-op paid commissioners a visit. Snow and ice have delayed installation of the septic tank and water well, but that will happen in the spring, said Johnson. NRECA spoke with the couple a day after the lights came on, and the Wilsons, while delighted, were humbled by the outpouring of support from people they’ve never met.